Marketing software-as-a-service (SaaS) solutions presents a unique set of challenges. In contrast to their on-premise brethren, SaaS marketers are tasked with delivering new messages to new audiences, and doing it all extremely cost-effectively. To paraphrase, Kermit the Frog, "It isn't easy being SaaS." This webinar will point out seven particularly nasty hazards faced by SaaS marketers. Better yet, it will suggest effective ways to navigate around these hazards. 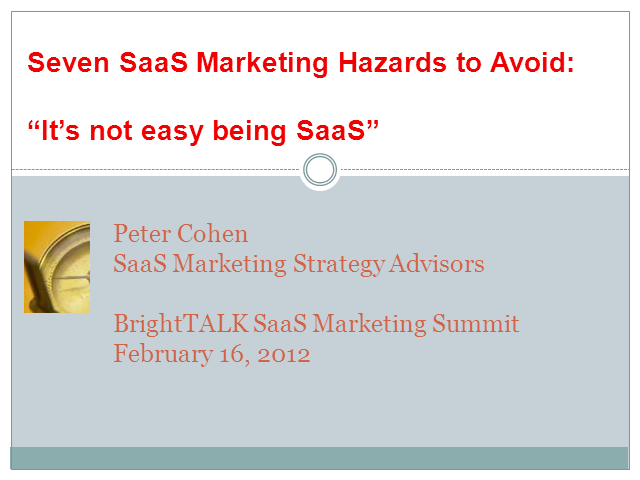 The speaker, Peter Cohen, is the Managing Partner at SaaS Marketing Strategy Advisors. His firm provides expert guidance to help companies effectively market and sell SaaS solutions to enterprises.